NEW YORK, March 25, 2019 /PRNewswire/ -- Umami Burger, sbe&apos;s world-renowned premium burger brand, is thrilled to announce the opening of their first three locations in Mexico City in partnership with Gin Dinar. Gin Dinar is a company in Mexico focused on hospitality and development business that currently has 70+ company-owned restaurants through GIN Group and is set to open 40+ Umami Burger and Katsuya restaurants in collaboration with sbe by 2021. These three locations are the first of 30+ additional Umami Burger locations planned to roll out in Mexico in the coming years. Umami Burger Merida officially opened to the public on March 23rd with two locations slated to follow, Umami Burger Querétaro opening April 11th and Umami Burger Puebla&apos;s opening May 10th. This announcement comes on the heels of sbe and AccorHotels exciting commitment to open over 100 Umami Burger restaurants across the globe in the next seven years. Sam Nazarian, Founder & CEO of sbe, states: "We are very excited to open our first three Umami Burger locations in Mexico City in collaboration with Gin Dinar and bring our Umami Burger brand to the community. Mexico is an extremely important market for both Umami Burger and the sbe portfolio, including our other acclaimed brands SLS, Mondrian and Hyde Hotels and Residences. We&apos;ve seen an unprecedented level of growth and are extremely excited to continue our expansion in Mexico." Javier Romo, COO of Gin Dinar states: "We are very excited about our licensing partnership with sbe. We believe that this brand will be a resounding success in Mexico as there is a market niche looking for refreshing and innovative options such as Umami. In the same way we are excited to have a relationship with a company such as sbe with which we feel closely linked in terms of its principles, mission and values. This brand is ideal for the portfolio of our company." 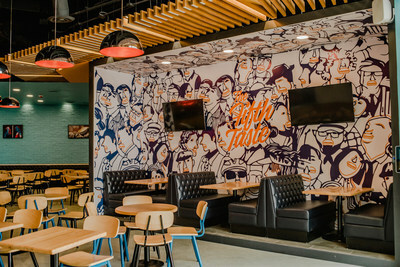 Architecture firm Abraham Cherem designed the three new properties to mirror the vibrant and aesthetically pleasing decor as seen in the US locations using natural wood, structured leather, and Umami Burger&apos;s iconic pops of orange and blue color. The menus will offer guests the same favorited dishes including the flavorful Manly Burger, the Sunny Side Burger, and mouthwatering Truffle &apos;Em Fries. The Umami Burger brand is aggressively expanding, having just opened two new locations in Japan this month with 17 more in the pipeline. Later this year, Umami Burger will introduce several locations in the Middle East with two locations debuting in Doha. Umami Burger Merida is located at La Isla Merida, Calle 88 #608, PB local PB-89, Colonia Temozon, Merida Yucatan, CP 97143 (Tel: 9999219151) and is open Sunday - Thursday from 12:00 - 22:00 and Friday - Saturday from 12:00 - 24:00. Umami Burger currently has 16 locations in the US, four locations internationally in Tokyo, Japan and Nassau, Bahamas. Founded in Los Angeles in 2009, Umami Burger has been named GQ&apos;s "Burger of the Year," Men&apos;s Journal&apos;s "Best Burger in America" and one of the "25 Most Innovative Consumer Brands of 2016" by Forbes&apos; CircleUp25. Currently, Umami Burger has 18 restaurants in California, New York, Illinois, Nevada, and Japan with additional locations planned around the world. sbe, the leading lifestyle hospitality company that develops, manages and operates award-winning hospitality venues, is Umami Burger&apos;s majority shareholder. For more information on Umami Burger, please visit umamiburger.com or follow @umamiburger or #umamiburger on Facebook, Twitter, and Instagram. Established in 2002 by Founder and CEO Sam Nazarian, sbe is a privately-held, leading lifestyle hospitality company that develops, manages and operates award-winning hotels, residences, restaurants and nightclubs. Through exclusive partnerships with cultural visionaries, sbe is devoted to creating extraordinary experiences throughout its proprietary brands with a commitment to authenticity, sophistication, mastery and innovation. Following the acquisition of Morgans Hotel Group, the pioneer of boutique lifestyle hotels, in partnership with Accor, sbe has an unparalleled global portfolio which will see 29 hotels and over 180 global world-renowned culinary, nightlife and entertainment venues by the end of 2019. The company is uniquely positioned to offer a complete lifestyle experience - from nightlife, food & beverage and entertainment to hotels and residences, and through its innovative customer loyalty and rewards program, The Code, as well as its award-winning international real estate development subsidiary, Dakota Development - all of which solidify sbe as the preeminent leader across hospitality. The company&apos;s established and upcoming hotel brands include SLS Hotel & Residences, Delano, Mondrian, The Redbury, HYDE Hotel & Residences, and The House of Originals. In addition, sbe has the following internationally acclaimed restaurants and lounges under subsidiary Disruptive Restaurant Group: Katsuya by Chef Katsuya Uechi, Umami Burger, Cleo, Fi&apos;lia, Carna by Dario Cecchini, Leynia and Diez y Seis by Chef José Icardi, HYDE Lounge, S Bar, Doheny Room, Nightingale, Skybar, Bond, and Privilege. To learn more, visit sbe.com. Gin Dinar is a company in Mexico focused on hospitality and development business.